With almost 90 active attorneys, GableGotwals has announced the promotion of three associate attorneys and two of council attorneys to shareholder status. The five new shareholders, who are split between the Tulsa and Oklahoma City offices, include Ellen A. Adams, Jeffrey A. Curran, Alicia J. Edwards, Thomas J. Hutchison and Diana T. Vermeire. Located in the Oklahoma City office are Adams, Curran and Vermeire while Hutchison and Edwards are in the Tulsa office. Ellen A. Adams’ practice primarily consists of prosecuting and defending corporate and individual clients in a wide variety of complex business litigation in state and federal courts. Her representation has been focused on clients in a wide variety of matters including environmental disputes, breach of contract, labor and employment issues, lease cancellation, and royalty disputes. 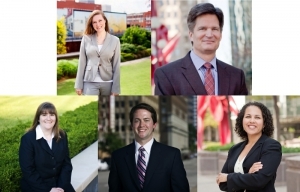 Ellen has been named a Rising Star by Oklahoma Super Lawyers since 2012. She is located in the Oklahoma City office. Jeffrey A. Curran’s practice focuses on product liability defense, insurance matters, intellectual property litigation and commercial litigation. He also maintains an entertainment law practice, representing motion picture production companies, musicians and recording companies in contract negotiation, licensing and related areas. Jeff has been recognized by Martindale-Hubbell as an AV Rated lawyer, Best Lawyers since 2014 and Oklahoma Super Lawyers since 2009 for his work. He is located in the Oklahoma City office. Alicia J. Edwards’ practice areas include environmental law and intellectual property. Prior to joining GableGotwals, she was an environmental scientist from 1999 until 2004. Alicia has been named an Oklahoma Super Lawyers Rising Star for Intellectual Property and Environmental since 2012. She is located in the Tulsa office. Thomas J. Hutchison maintains a general business practice, advising clients on entity selection and formation, mergers and acquisitions, energy and natural resources, securities and corporate finance, commercial and contract issues, and corporate governance. In addition, Tom counsels health care providers regarding business and regulatory issues and has extensive experience advising financial institutions. Tom has been selected as a Rising Star by Oklahoma Super Lawyers since 2011. He is located in the Tulsa office. Diana T. Vermeire has extensive experience in the corporate and nonprofit sectors, including state and federal litigation; labor and employment law; administrative, regulatory and legislative advocacy; policy analysis and management. She brings a unique skill in the area of compliance review for companies that includes an analysis of work place policies and procedures, identifying areas of exposure for potential litigation, and offering solutions. Diana is located in the Oklahoma City office.